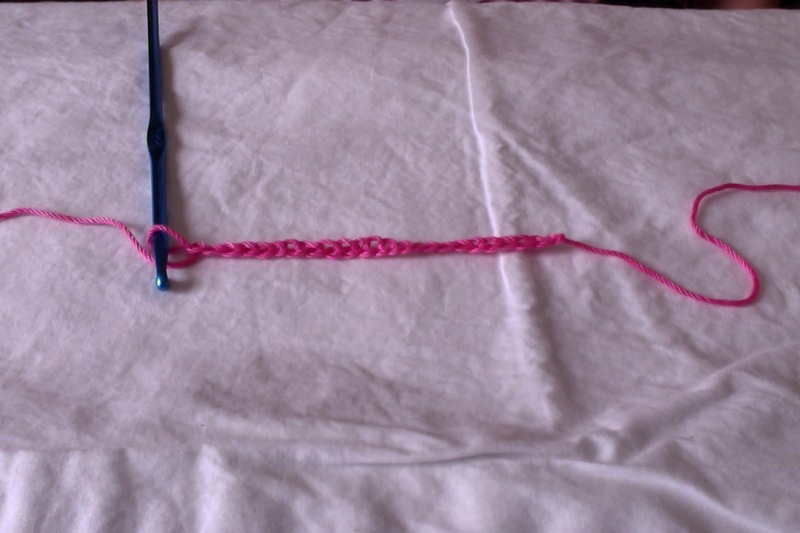 The chain stitch is the first stitch in crochet. It is essentially a series of loops within loops. Depending on the tension, the chain stitch can seem like tight knots or loose bunny ears. Ideally, in crochet, we want to meet in the middle of each, but depending on the person (or even the day the person has had) it usually doesn’t work out that way. I once was working with a friend who wanted to learn to crochet. She is the most relaxed, free spirit I know, and yet her chain stitch was so tight I couldn’t get my hook into it to start a single crochet. Sometimes, the chain stitch is the hardest task to manage, but with most things, the first step is always the hardest. Step 1: Hold your hook, thumb and index finger on opposite sides. Thumb should be closest to you, middle finger is under the hook to hold the yarn end for extra control. Step 2: With opposite hand, holding the yarn between index and middle finger, wrap yarn, from back to front twice. Take this hand and pull the first loop over the second and hook. 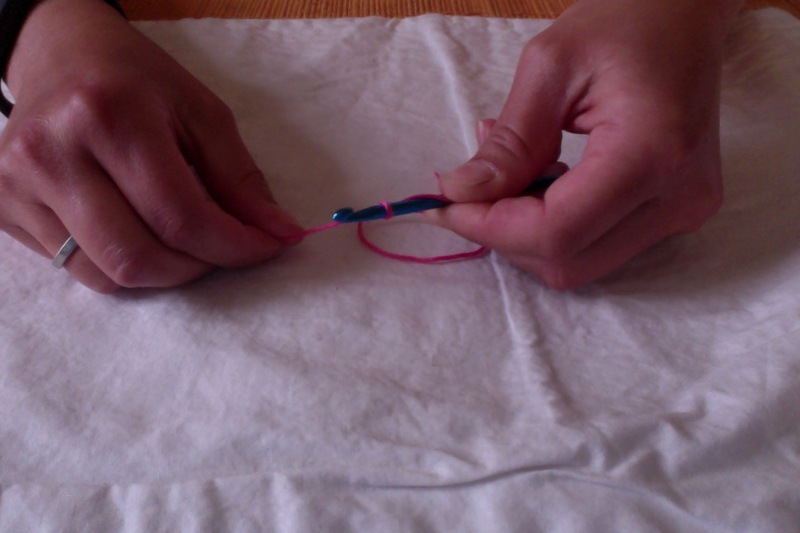 Your first chain stitch is made. Step 3: Continue to wrap yarn from back to front (once from now on) and with the hook pull the loop downward and through the loop that is already under the hook, letting this hook to slide off the hook and begin creating a chain. Step 4: Repeat this process until you are comfortable with the chain. As your chain gets longer, your index finger and thumb of the “wrap hand” can hold onto the chain to ensure the tension is even and the loops are similar. Don’t stress too much if they are not perfect. The idea is to get an even tension, that is not too tight or not too loose, but often you get one or two spread out that are bigger or smaller than the rest. Just pull on the opposite sides of the chain, and if they look even they will work. In my example chain you can see some differences in loop size. Still, there is none that are extreme one way or the other, so I will not adjust. If you are not happy with your tension, it is an easy fix. Simply take the hook from the last loop and pull the attached yarn. The chain will unravel. The greatest thing about crochet is that even though the chain unravels, you can pick it up again from any point. Just insert your hook into the top loop and try again. Even though the chain stitch is the first stitch in crochet, many crocheters are using it as part of their finished work. Today we are seeing chains of all different tensions and yarns/materials as the base of necklaces and bracelets. As more and more crafters are thinking outside the box we are able to use this stitch as a main event, as opposed to just a starter stitch. So whether you want to add something special to a DIY project, or begin your crocheting journey, you can’t go wrong adding this stitch into your repertoire. Thanks again, and happy crafting!